There’s a new device like the fidget spinner and it’s growing to be just as popular! 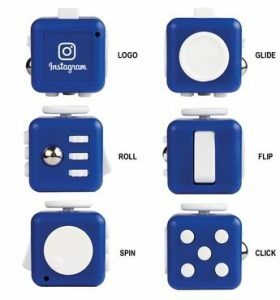 The Fidget Cube is a plastic cube equipped with dials, switches, buttons ad more for fretting hands. When compared to other stress relievers and fidgeting tools, the cube is a multi-use device that exists on a higher plane of distraction. Pen clicking, knee shaking, table tapping and coin spinning (or twirling anything in your hand) is distracting to everyone around you in the office and at home. However, the hypnotizing spinner may not be as professional as what you need in an office setting. Lucky for the incessant fidgeter, there’s more than one way to fidget the day away. Avoid the hassle of annoyed coworkers, spouses and siblings by releasing your need to fidget with the fidget cube, the latest installment of stress relieving toys. This toy, however, can be used for more inconspicuous play. A bonus is that fidget cubes are manually-operated mechanical toys that don’t require batteries to operate. Small and compact, the cube easily fits in a handbag or brief case, and can be discreetly used in a pocket. Because it’s so small, the fidget cube is a premium desk toy that is perfect for office meetings, boardroom discussions and while talking on the telephone. It may also be better in the classroom than its predecessor because it is small, compact and concealed. This fidgeting tool can be held out of the view of other classmates, keeping distractions at a minimum. Another benefit for use in the classroom is that these fidget aides teach children a little bit more about physics. Please note: the scientific jury is still out on whether the cube has mental health benefits. This gadget is fun for everyone! However, because these stress-relieving tools have moving parts, we would never recommend them for children who are younger than five years of age. Relax: The first side is reserved to highlight your logo. This side has a beveled edge and can be used like a worry stone of ancient history (and a trend in the 80s). Simply hold the cube in your hand and rub repeatedly in a comforting motion. Flip: If you were the kid who would flick a switch up and down just to hear and feel it click, this side is for you! Side two is a switch you can click back and forth like a light switch. Glide: A swivel console stick (joystick) that quietly rotates and glides across the surface in every direction is located on side three. Spin: A spinning disk is on side four, which is a favorite distraction for anyone’s thumb. Click: Side five has five buttons and looks like the #5 side of dice. This is referred to as the “pen click” side and feels like a cross between a ballpoint pen and bubble wrap. These buttons can be depressed in varying order. Three of the buttons are audible and two are silent. Roll: The sixth side serves double fidgeting duty providing two things to do. One is a clickable and movable metal ball-in-socket (marble) that rolls silently below the second widget which is a set of three tactile gears that make a ratcheting sound when moved. Loud enough for you to hear when you flip them up and down without disturbing the person closest to you. This promotional fidget cube was designed for people who can’t keep their fingers still. Many clicking, flicking and spinning addictions can be squelched by using this toy created to release the urge to fidget. The result being people can focus on the task at hand. The simple stress reliever was created by brothers Matthew and Mark McLachlan, cofounders of Denver-based (and appropriately named) Antsy Lab. These inventors launched their product on Kickstarter. Both brothers had a hard time sitting still while working. When we’re brainstorming, working through a project, or just on a phone call, the brothers are almost always moving around and playing with things. They researched the tools available for fidgeting and didn’t find any that they felt truly comfortable using in a professional setting. So, they designed their own device – the Fidget Cube! Fidget cubes come from the retail sector. When your company taps into current trends, your business will become cool by association. Products seen on retail shelves have a higher perceived value so they make a more impressive gift. For certain audiences and industries, it can be the ideal way to set your message apart. When brand recognition is on the line, perception is key, and brand name promos are a sure-fire way to make a lasting impression. Consider investing in promotional products that you’ve seen in shops and stores for your next marketing idea.